2003 was the year when we Indians were introduced to the Ford Endeavour. The big, menacing SUV had an old school design and massive proportions to win over the bada hai toh behtar hai audience. However, 6 years later that love affair was tested thoroughly with the arrival of Toyota’s Fortuner. The Fortuner offered some of the design traits and off-road ability of the legendary Land Cruiser at a more affordable price, backed by Toyota’s reliability quotient. The formula didn’t need much time to succeed and even after considerable price hikes, it continued to be the best-selling SUV in its segment year after year. The Endeavour too upped its game consistently, with new drivetrains, features and updates to make it more current, but it was the Fortuner that continued to dominate. In 2016, the vastly improved and even more appealing second generation Ford Endeavour took on the aging Fortuner, and won. 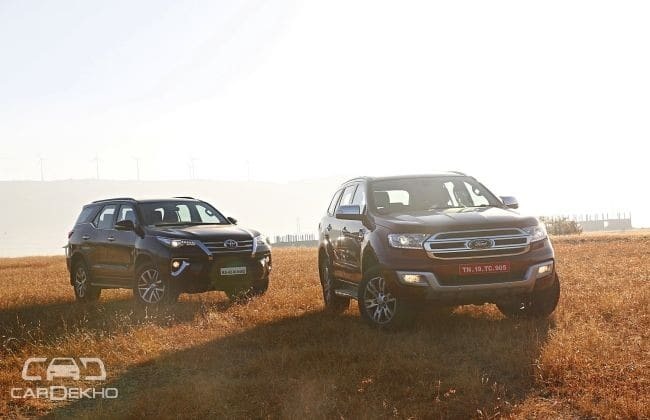 However, the all new Fortuner is here to reclaim its position as the undisputed number one and has, no doubt, got Ford wondering if history will repeat itself. Time for a battle that’s really personal. Both SUVs had distinctive designs in their first generations and it’s no different now. The Fortuner looks slimmer than before and trades the straightforward macho look for some newfound flamboyance. The sleek LED headlights and forward diving chrome grille make it look more athletic and there’s more flashy chrome around the fog lights and windows. 18-inch alloy wheels look gangsta, while the uniquely styled window-line finely splits the glass area from the bodywork. The ‘Fortuner’ engraved rear chrome applique is a familiar touch, while slim LED headlights fashionably round off the tail, completing the future-first aesthetics. The Endeavour, though, is a perfect blend of retro and modern design. It doesn’t have the loud, Lexus-like styling elements of its rival, but sticks to the traditional look of an American SUV. Its muscular bonnet and bi-xenon headlights encase the flat signature grille, making it look lovably menacing. The side profile has the same no-nonsense appeal, with a fat chrome badge on the fender boasting of its engine size. Like the Fortuner, it too gets 18-inch wheels and LED tail lights and while it’s 2mm taller than the Toyota, it’s 5mm wider too, making its stance heftier. At 4,892mm, the Endeavour is 97mm longer than the Fortuner and the wheelbase is 105mm larger as well. Like the Innova Crysta, the new Fortuner has dropped its budget-cut interior for a more premium setup. The all-black cabin looks sporty and while there are a few components shared with its MPV counterpart, it’s no copy-paste. It now gets leather upholstery and trim, combined with wood grain and silver touches that make up for the feel-good factor its predecessor lacked. However, you still get a heap of hard plastics on the dashboard and doors, and the average fitment quality of bits like the flip-out cupholders and dual gloveboxes keep it from feeling ‘luxurious’. Practicality, though, isn’t an oversight. There’s a large storage spot under the armrest, bottle holders in the centre console and even a little spot behind the gear lever for loose change or your keys. The door pockets are quite accommodating too, but they’re quite tricky to access because of the door armrests. Occupants in the second row get seat-back pockets and baggage hooks, plus an armrest with pop-out cupholders. A big plus is the reclinable seat which will be a boon for chauffeur-driven owners. A groove in the lower part of the B-pillar acts as a grip for kids to clamber up and into the second row. Very thoughtful! Apart from the sliding middle row, the rear seat also gets the one-touch tumble forward feature that makes accessing the third row easier. The Endeavour is no slouch on the usability front either, but wraps it all in a classier package. The beige-black dual-tone cabin adds to the sense of space and the centre console layout in particular, looks much neater and pleasing. It too gets ample storage under the armrest and cupholders in the middle, and while the door pockets aren’t as accommodating, they are easier to access while driving. The generous use of leather for the dashboard adds to the sense of luxury. Even the hard-plastic trim feels a notch better than the plastics in the Fortuner. However, the lower half of the dash could have been of a better quality. One pain point in the Endeavour is the access to the third row; while the second row seat slides forward, the backrest flips forward only partially to open up a V shape to clamber through. Also, the third row isn’t as comfortable as on the Fortuner. You end up sitting lower to the floor, and space to tuck your feet under the middle row is a bit tight in comparison. Both SUVs are large enough to fill an apartment, so space is aplenty. However, the Endeavour has the better front seats as the Fortuner’s centre console is a little intrusive as is the power window console. The Ford’s dashboard is lower set too, giving you a better view out of the cabin. The larger windshield also helps build on that sense of space. The rear seat also offers better under-thigh support, but the Fortuner gets a little more leg space and knee room here. The Toyota also has the better third row that’s not only easier to access, but has cushier seats as well. That said, neither SUV offers a last row that can be deemed ‘comfortable’ as they’re suited to kids or short adults over small trips. Unlike their predecessors, both come loaded with features. It’s here where things get really tricky so let’s sift out the unique bits first. Unlike the Endeavour, the Fortuner gets a smart-key, push-button starter and cooled upper glovebox. On the other hand, only the Endeavour gets a panoramic sunroof, semi-auto parallel park assist, front parking sensors, a range of selectable ambient colour options and a power folding third row. Both get one touch up/down windows in the front two rows, sunshades with auto-illuminated vanity mirrors, instrument clusters with super-detailed MIDs and cruise control. They also get touchscreen infotainment systems, but navigation is standard only with the Fortuner. However, the Endeavour’s system is better to use and look at, gets Ford’s SYNC3 interface (that supports Android Auto and Apple CarPlay) and isn’t a dust magnet. The 10-speaker sound system is far better than the Fortuner’s 6-speaker arrangement, while the voice command setup is more user-friendly too. The Endeavour misses out on reach-adjustment for the steering, while the Fortuner doesn’t get dual-zone climate control. Evidently, the Fortuner’s package is more practicality focused, while the Endeavour’s strikes a balance between usability and the wow factor. Unsurprisingly, the American likes it big and gets a full-fat 3.2-litre, 5-cylinder diesel engine making 200PS and 470Nm, compared to the Fortuner’s 2.8-litre, 4-pot motor that plates up 177PS and 450Nm. However, the Endeavour’s also the heavier of the two, tipping the scales at 2,394kg while the Fortuner weighs 2,135kg. Stand outside either SUV and they sound the same, but step into the cabin and the noise and vibrations are managed better in the Ford. At idle the engine is just a bit more audible in the Ford. But as the revs climb, the active noise cancellation makes the Endeavour feel pleasingly quiet and less tiring over longer distances. In comparison, the Fortuner’s motor sounds rather crude at hard revs and there’s oodles of clatter that dampen the experience. At low speeds, both offer smooth torque delivery and are fairly muted, but things change when you put pedal to the metal. The Endeavour surges ahead as the engine revs eagerly emit an angry, almost muscle car like growl. While the sound could be synthesized, the performance is very real. The Fortuner’s engine also has a good amount of punch, but in a straight line it starts to fall behind, and this is down to its gearbox. Both get 6-speed automatic gearboxes and here too, the Endeavour gets the upper hand as the transmission is quicker to respond and smoother between shifts too. It doesn’t get paddle-shifters like the Fortuner, but its manual mode is more intuitive. The result were apparent in our tests. The Endeavour accelerated from 20-80kmph in 6.54 seconds, while the Fortuner managed it in 7.20 seconds. The Ford was also quicker in the 0-100kmph sprint with a time of 10.86 seconds compared to the Fortuner's 12.14. That said, the rivals have a lot in common. They’re great long distance cruisers and both sit a hair under 2,000rpm at 100kmph. Additionally, you get the assurance of great off-road ability. Toyota offers a shift-on-the-fly 4x4 knob with active traction control, while the Endeavour gets Ford’s terrain management system that modulates everything from the 4x4 system and gearbox, to the brakes and throttle based on the off-roading condition. We put both through some mild off-roading and found them equally ready for the rough stuff. However, the Endeavour’s front parking sensors offer great assistance while approaching tricky obstacles. The Fortuner’s ride quality has improved dramatically over its predecessor. It feels more stable at high speeds and vertical movement is managed better than the Endeavour too. While both laugh their way through broken roads, the Endeavour pummels through potholes with more confidence and comfort. Typical of ladder-frame SUVs, there is a fair amount of body-roll in both, and while the Fortuner’s pitch and bounce control stabilisation system helps it settle down quicker, it’s the Endeavour that feels better thanks to the Watts linkage rear suspension. Its low speed ride quality is more pliant and that sense is reinforced even over crater strewn roads. There is also less shudder when thudding through the bigger potholes. The Ford’s steering adapts to changing speeds perfectly, is more direct and offers more feedback too. This doesn’t mean the Endeavour is a hoot to drive, but it is the more involving to drive of the two, but crucially, it is the easier vehicle to point with accuracy and confidence. Overall, the Ford just feels more sedan-like to use. Braking, though, is better in the Fortuner. Both get all-wheel disc brakes, but the Endeavour’s pedal action is spongy while the Toyota offers better bite and feel. The Endeavour’s heavier weight and bigger engine see it come out as the thirstier of the two. While the Fortuner delivered 12.38kmpl in the city and 15.04kmpl on the highway, the Endeavour managed 8.5kmpl in city, but a decent 14.64kmpl on the highway in our road tests. Both get loaded with safety tech, including 7 airbags, ABS with EBD, traction control, hill-launch assist, hill-descent control, ESP and 3-point seatbelts for each occupant. As far as shootouts go, it’s hard to get closer than this. The new Fortuner has made up for all of its predecessor’s faults and is now a considerably more competent package. It also comes with Toyota’s brand backing and reliability which does seal the deal for many. However, as close as these bedfellows are, it’s the Endeavour that comes out on top. It offers the more comprehensive package whether it’s a matter of features, performance or just the premium ambience it provides. Despite the Toyota’s new-age styling, the Endeavour comes across as the more modern package and importantly, the more affordable one still! Not only does it give you that little bit extra, the Endeavour 3.2 Titanium is around Rs 65,000 cheaper than the Fortuner 2.8 4x4. While both brutes make for a compelling purchase, the Endeavour feels nicer to drive and does a better job of justifying its price.